Canadian Foreign Affairs Minister Chrystia Freeland and Prime Minister Justin Trudeau in friendly discussion with Honduras Foreign Affairs Minister Maria Dolores Agüero at the Lima Group meeting in Ottawa. Janet Spring today (Feb, 6 2019) renewed her request for a meeting with Freeland and Trudeau since they have now been able to meet Agüero, with whom Karen Spring has had contact regarding Espinal’s case. The wife of a political prisoner detained in Honduras, speaking by Skype to a meeting in her home town in rural Ontario, has called on the Canadian government for help in her efforts to free her husband. “Since we were married on October 18 last year, I’ve been only able to see him for six hours,” she said. Spring said she is working with lawyers as there may be an announcement soon of a hearing to be held in her husband’s case. It will determine whether the case will be thrown out or go forward. “We are basically preparing for a show trial,” she said, because of the politicized nature of the Honduran court system. It’s time the Canadian government stopped backing the Hernandez regime, she said. Karen’s mother Janet, just returned from a trip to Honduras, decried ‘horrific” conditions in the LaTolva jail – so horrific that the Canadian embassy representative who visited Espinal there last week fainted after coming out of the module where he is being held. “Prisoners are not being treated as human beings,” Janet Spring said. “Our Canadian government is complicit in this because they have not called out the Hernandez regime for these violations of human rights,” she said. The Canadian embassy has made two token visits to the prison, she said, but has not spoken out against Espinal’s treatment. John Spring –Karen’s father – referred to a recent international intervention by Canada, the safe haven offered to 18-year-old Rahaf Mohammed Alqunun, who has no Canadian connection. 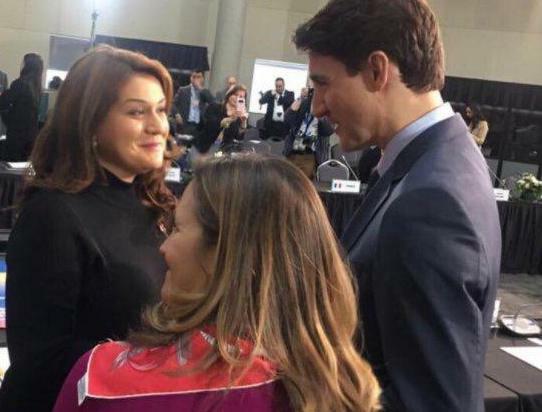 “Why do you think that a Saudi girl gets the attention of our prime minister, our foreign affair minister but yet Jan has been down to Ottawa six times in the past year and the best we’ve been able to do is get to one of (Chrystia) Freeland’s top aides?” Spring asked. He directed the question to provincial Progressive Conservative MPP Doug Downey, one of the invited speakers. Freeland’s actions were “odd on several levels,” Downey replied. 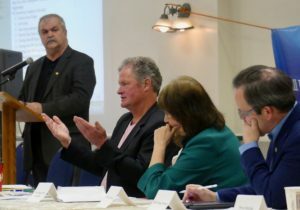 “I don’t have a straight answer for you.” Downey said he has an understanding of the family’s case through the work of Simcoe North MP Bruce Stanton, and he intends to do what he can to help if intervention at the provincial level is possible. Stanton was unable to attend and sent a statement that was read out. MP Alex Nuttall, who has sponsored a House of Commons petition, did not make the meeting either. He has sponsored an e-petition that people are urged to sign before it closes at 3:47 pm on Feb. 7 2019. – Grahame Russell of Rights Action, also recently returned from Honduras. He warned that Espinal, who has been placed in a military jail to be made an example of to deter others from opposing the government, is at serious risk of being attacked or killed.